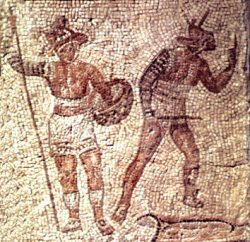 a group of thirty or maybe seventy gladiators from the school of Lentulus, in Capua, near Naples, revolted and fled on the Vesuvius. They chose as leaders Spartacus, Crissus and Enomaos. Spartacus was a gladiator, from Thrace; little is known of him; the historian Appianus says he was a Roman soldier, then prisoner and slave, while Florus says he was a mercenary, then a soldier, then a deserter, then outlaw and at the end gladiator. Soon the number of the fugitives increased; many slaves left (or killed) their masters and fled to join the army of Spartacus. They were mostly from Italy, but there were also many slaves from Gallia, Thrace and Germany. 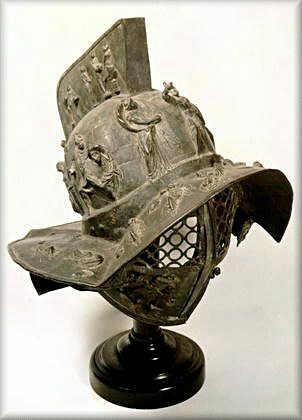 They started raiding the region of Campania, taking over several cities; the Italic cities did not support the rebels, so they occupied them by violence. At first the Senate did not take the revolt seriously, and did not even think that such a bellum servile (war of the slaves) could be worth a real legion. So it happened that Spartacus and his men could hold in check the Roman forces and were free to roam the South of Italy. Later on, they went up north, up to Mutina (today Modena) where the army of the slaves defeated again the Roman army of Cassius. Spartacus then tried to force his way towards Rome, but was stopped by Crassus, so he took the long way around and passed east of Rome, back south to Lucania. It seems that he was directed to Sicily, but could not cross the strait between Italy and Sicily and was stuck at the end of the peninsula, near Reggio. Crassus then tried to close Spartacus in the tip of Italy by digging a trench from coast to coast; during a stormy winter night the rebels amassed earth, branches and materials to fill up the trench, and one third of the army managed to escape in this way. In the meantime the Romans had understood the danger of the war, and took drastic measures. Crassus, for instance, punished the soldiers who had fled by applying the decimatio, i.e. the execution of one soldier out of every ten. After one defeat against Spartacus, Crassus had 4.000 of his soldiers executed: they had to fear their general more than the enemy. Though inhuman, according to modern standards, the system worked, and in the following battle the soldiers attacked furiously an army of 10.000 and killed two thirds of the enemies. More slaves were killed in a battle at the Lacus Lucanus, but the final confrontation took place near Brundisium, at the end of the Appian Way. Plutarch wrote that before the battle Spartacus killed his horse: if he won, he could get all the horses of the Romans; if he lost, a horse would have been useless. 60.000 rebels were killed, and 6.000 were made prisoners and crucified all along the Appian Way from Rome to Capua. The body of Spartacus was never found. Revolts of the slaves were frequent in the Roman world, in the years from 133 and 72 BC. In the middle of the second century BC there were many: in 132 BC and in 104 BC in Sicily (a revolt which lasted until 99), and in fact the one of Spartacus was the last great revolt of the slaves. The reason for the turmoil was mainly caused by the great amount of slaves that had been brought to Italy from all over the Mediterranean. In those years the Romans had managed to control the slave trade of the Mediterranean, which can be compared to the oil market of today. Slaves were energy. And the trade was flourishing: in the greatest slave market of the antiquity, the island of Delos, 10.000 slaves could be sold in one day. In Italy, this enormous intake of cheap labour contributed to the disappearance of the Roman farmer/soldier and to the concentration of enormous estates in few hands. The slaves were mainly owned by big landowners, and small farmers could not withstand the competition from the slave owners. Slaves were often kept in subhuman conditions on these huge estates, which were fertile ground for the revolts. Seneca wrote that in Rome there were so many slaves that a proposal of law to have them all dressed in the same way was soon withdrawn because the slaves could have understood how many they were.